This weekend I was lucky enough to get the chance to go hiking up Table Mountain in Cape Town via the Skeleton Gorge trail. For years I’ve been hearing about this particular route. So many people have been telling me just how epic the hike to the top of Table Mountain via this route was. But, I really didn’t feel fit enough to hike up to the top, and all the way down again. Recently, though, I noticed that I have been feeling more comfortable and confident on hiking trails, so I decided that it was time for me to put myself to the test. Jake, myself and our friend Michael set aside a Sunday to do this particular hike. I was so excited to finally get the chance to do this hike. When Jake told me that the cable car was under maintenance and we’d have to hike back down, I thought he was joking. Turns out, he wasn’t. I’ll admit that I was more than a little intimidated by the idea of hiking back down Table Mountain, but “Hey”, I though “It’s down-hill. How bad can it be?”…note to first time hikers, coming down a mountain can be harder than going up, depending on the hiking trail you take. I have since learned my lesson lol. We started the hike at Kirstenbosch Gardens entering at the top gates to save ourselves from having to walk up from the bottom of the gardens, which can be a mini hike in itself as it’s all up hill. The plan was to take a leisurely hike up to the top via the Skeleton Gorge hiking trail. We would stop every 20 minutes or so to take in the view. Honestly this is the best way of hiking Table Mountain Cape Town. Hiking Table Mountain from this direction is beyond magical. You are surrounded by a forest of trees, emerald moss covered rocks and streams and springs just about everywhere. The trees keep you shaded and cool and it’s a shame to rush such a beautiful hike in case you miss a beautiful view of a stream or fallen log covered in mushrooms. Occasionally the canopy opens up and offers you a glimpse of Table Mountain looming over you like a patient giant. Spectacular is not a strong enough word to describe the sights and sounds. And, of course, we made some new friends on the way. The hike itself was fairly straight forward and dare I say it, easy, but steep. The first real challenge of the hike came in the form of wooden ladders that you had to climb in order to get into the gorge itself. These can be quite scary as they are the only way to get up the path that’s worn out by a stream and small waterfall. Hiking Table Mountain via the Skeleton Gorge hiking trail took about 2 hours. If the cable car had been working we would have taken another 2 hours to hike across Table Mountain itself (a fairly level hike with little incline) to the cable car. We would have caught the last one down (usually 5pm). But, unfortunately, we had no choice but to hike back down again. It was getting late and we couldn’t risk getting stuck on the mountain at night. We could have walked to the cable car and hiked down one of the trails there, but that would have taken too long. So, instead, we took the Nursery Ravine Hiking path back down to Kirstenbosh Gardens. The Nursery Ravine Hiking trail is not particularly difficult, but I do get why it’s called the path of 1000 steps. I tried counting them but I lost count. While the views on the hiking trail are stunning, I wouldn’t recommend this route, especially not going down. It is nothing but steep steps all the way and it was total hell on my knees. If I could do the hike again I would take the Skeleton Gorge hiking path back down to Cape Town too. it’s a much more epic trail and is less strain on the knees. While Hiking is an all weather sport I don’t really advise doing the Skeleton Gorge Trail when it rains. The path and the ladders may become dangerously slippery. But, Because Cape Town is soawesome there are plenty of other things to do when it rains in Cape Town. If hiking isn’t your things at all you can always explore some of South Africa’s most gorgeous gorges by ziplining way above them. Kirstenbosch Gardens is a large botanical garden linked to the Table Mountain nature reserve. these gardens are incredibly well kept and showcase all the plants that occur naturally in the Western Cape. You will often see descriptions of the plants and their uses on little plaques scattered throughout the garden. This is such a lovely spot to have a family day out or a romantic picnic. you can easily picnic the whole day away, listening to the wildlife around you and enjoying the amazing views of Table Mountain from your picnic blanket. If you are lucky you may even get a visit from the ducks and guinea fowl that walk freely around the gardens. The Kirstenbosh Gardens are also a starting point for may popular hikes up Table Mountain. As soon as you start the hikes from the Kirstenbosch Gardens side of the mountain you are surrounded by a lush green forest. It is completely different vegetation compared to the front side of Table Mountain, I guess that’s what makes it so special. All of the rivers seem to flow down this side of the mountain so you get tall trees, furns , muddy paths and even springs flowing out of bare rock. It really is a magical sight. You instantly feel like you are far from the city and in some fairy place. As you walk up Skeleton Gorge and come closer to the Gorge aspect of it, you will hear streams and tiny waterfalls all around you. You will even come across a few of them. The water looks a reddish, like tea, and just like the dam on top of Table Mountain, this is due to tannins from the fynbos all over the mountain. A lot of local hikers actually fill their water bottles from the waterfalls and use this a refilling station. The water is perfectly drinkable and refreshingly cool. Be careful though. Only fill your water from the waterfall part of the stream, and only if you see it coming directly out of the rock itself. Never fill your bottle from stagnant water because you don’t know what’s growing in that water or what could be contaminating the water. A lot of people take their dogs up some of the trails and chances are the dogs have drunk from the water too. As you go along the Skeleton Gorge rail you will start seeing the gorge aspect of the trail. this is a deep cleft in the mountain where a waterfall comes through. The first clue that you are entering the gorge are a set of wooden ladders that are suspended over a tiny waterfall. Climbing up the wooden ladders was an adventure for sure. It was scary as hell because the wood was very slippery and the ground was muddy, which made our hiking boots slippery too, but it was also very epic. A tiny little stream trickles over the rocks against which the ladders are places, so the ladders can get wet, but you also feel like you are climbing up a waterfall, albeit a tiny one. This is an experience you won’t get in a hurry. The trick here is to stay calm and hold on tight and go slow. After the ladders there is a bit of a rock scramble up a waterfall till you get to firm ground again. This was another unforgettable experience, with views of a gorge you won’t easily find anywhere else on Table Mountain. You have to scramble over a quite a few rocks to make it up the waterfall and it’s even scarier than the ladders, but if you go slow and steady and mind your step every inch of the way, you will be fine. #7 A Beach on the mountain. You know you have reached to end of the Skeleton Gorge hiking trail when the path suddenly turns into beach sand. This was a total shock to me but a few meters on I saw why. When you reach the top of Table Mountain via this hiking trail you are greeted by a small beach. I love beaches so this was the best reward at the end of a hike that I could have asked for. The hiking trail/ sandy pathway lead us to a magical little beach on top of Table Mountain. I couldn’t believe my eyes. It was so surreal to imagine having a beach on top of a mountain, but here it was. And what made it even weirder is that the water is completely red. Not like blood, but more like tea. This is also a completely natural phenomenon and you’ll see it in many of Cape Town’s dams. It’s due to the tannins from all they fynbos seeping through the soil and into the water. After a picnic on the red-water beach we took a walk along the dam wall, making our way to the little (very little) museum. The dams at the top of Table Mountain were built over 100 years ago. If you are interested in the history of Cape Town and Table Mountain you can visit this little museum to find out more about how it was done . If the museum is not open you can always just peep in through the windows like we did. You can still see the train that was used in building the dams. At the top of Table Mountain there is a little museum dedicated to the railway and trains that were used to build the dams over 100 years ago. The little museum at the top of Table Mountain was something I never expected. On display they have the train and some of the machinery that was used to build the dams. How they got all that equipment up to the top of the mountain is beyond me. It could not have been easy. The epic views of Muizenberg were another amazing reward. Skeleton Gorge starts on the back side of table Mountain. If you are expecting to see the CBD and Green Point then you should rather take the hiking routes on the front side of Table Mountain. 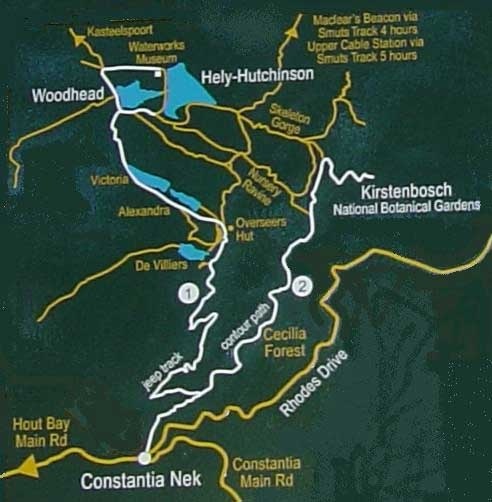 Alternatively you could walk the route that goes from Skeleton Gorge to Maclear’s Beacon to the cable car. (If you are going to take this route make sure that you have a good map or a guide to go with you so that you don’t get lost. Some of the routes and paths are not clearly marked out). Hiking Table Mountain Cape Town is an experience I totally recommend to anyone visiting, but, as with anything there are a few safety tips you need to know before taking the Hike. Please be safe on the mountain. It is dangerous and people often get hurt and have to air lifted out. #1 Table Mountain is a mountain, and one with a steep incline. This means that any hike to the top will be tough. Being gym fit is very different from being mountain fit. This is mainly because of the steep incline and the uneven surface you will be hiking on. It’s not a nice smooth paved path, which means your joints will have to work much harder. If you are not fit enough for this please don’t attempt any hiking trail up Table Mountain, the risk of injury will be too high. #2 if you are planning to go hiking on Table Mountain always carry enough food, water and clothes for the hike. The temperature on the mountain changes suddenly from warm to cold at a whim, so dress in layers. #3 always, always, always go in a group and leave no one behind. The rocks you will be walking on can be slippery, uneven and lose which means broken ankles do happen. Never leave anyone alone on any hike in case they get hurt. #4 carry a charged phone with emergency numbers on it in case you get stuck on the mountain and need to be rescued. Also let friends and family know where you are hiking and which routes you will be taking so that if you can’t phone out they can call the rescue services for you. (note plural – one always breaks) in case you get stuck on the mountain and have to spend the night there. #6 if you can help it, don’t get stuck on the mountain. It gets very cold up there at night. You really don’t want to get stuck there without anything to keep you warm. If you do get stuck on the mountain, do not carry on walking. The risk of breaking an ankle or leg is just too high at night. Rather find a warm spot and wait it out till morning. #7 have the right shoes to avoid injury from slipping or twisting and ankle. The Skeleton Gorge Hiking route has to be my all-time favourite hiking routes in Cape Town, and especially on Table Mountain. There is so much to see and explore on this route that you almost, almost, don’t feel the strain. Hiking Table Mountain Cape Town should be on your bucket list when visiting Cape Town. It is one of the most epic experiences to be had in Cape Town, especially if you choose the right hiking trail. If you are looking for other ways to explore Table Mountain then you could try caving. Table Mountain is just riddled with cave systems that have been carved out by water that eventually emerges from the springs. If you are considering caving then you do need to make sure that you go with an experienced guide or two who know the cave systems very well. All of these call centres are primed to respond to incidents on TMNP and investigate suspicious activities.